Every year, Jimmy Kimmel asks parents to lie to their children, telling them they ate all of the Halloween candy. Jimmy Kimmel Live! then sifts through the kid’s reactions to bring us a few moments that are priceless, and more than a few that are not so priceless, but are pretty darn funny. You can catch the video, below. This year, Jimmy Kimmel Live! 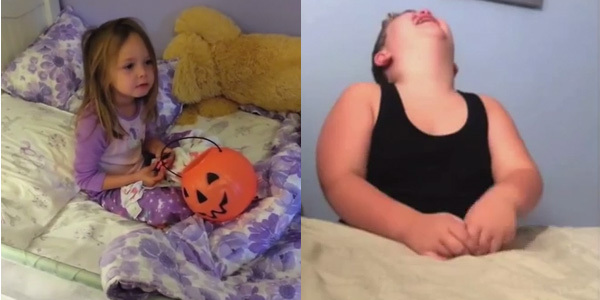 scoured through nearly a thousand “I Told My Kids I Ate All Their Halloween Candy” videos to bring us the most outrageous reactions from kids who were told their parents got to eat the candy, leaving them with nothing after all of that walking on Halloween. As you might expect, there are plenty of kids who just can’t control themselves when they find out mom or dad consumed all of their candy. There are plenty of screamers, one remarkable curser, and a few kids who have serious temper tantrums, banging their heads on inanimate objects and making a huge mess while throwing things that they shouldn’t. The kids who get overemotional are to be expected, but I love the kids who have more quizzical, kind or mean-spirited reactions. In particular, the kid who amuses me most in the calm little guy who inquires what happened to all of his candy, “All of it? Every single bite? You must have a bellyache.” There’s also the girl with the great eye-roll who sarcastically tells her mom to “eat an apple” when she admits she ate all their candy. Or the world’s two cutest kids who responded with the reactions, “That’s OK,” and “We’ll get some more next time.” Those kids rock. Look, we recognize that not every kid is an angel (or even remotely good at self-regulating) and not every parent is willing to lie to their kids about Halloween candy to get a few laughs. However, I’m fully confident that parents know what their individual children can and cannot handle, and besides, the whole thing is for a good cause. Jimmy Kimmel Live! makes sure to push Operation Gratitude at the end, which gets treats and care packages to soldiers who are stationed away from home. You can find out how to donate, here. Or, if you are game to check out a few more screamers and a few more awesome kids, you can check out last year’s “I Told My Kids I Ate All Their Halloween Candy” video. If you want to catch some of Kimmel’s other grown-up comedy, you can check out “A Game of Words” or Kimmel’s Apple watch prank. ABC’s Jimmy Kimmel Live! airs weeknights at 11:35 p.m. ET.